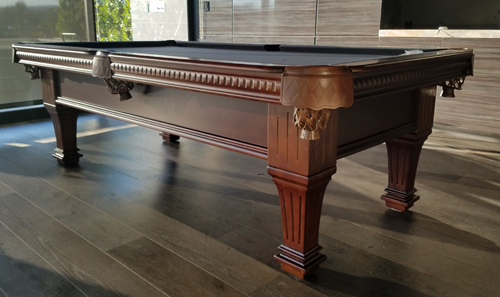 This Mission Style Pool Table features rails made of solid maple wood with mother of pearl diamond sites and K-66 profile natural gum rubber cushions. It has a 1.25 inch thick solid maple straight frame cabinet with a pull out drawer for storage of your pool table accessories. The legs are mission style and extend up to the slate. They are made of solid maple wood. As expected of any top quality Pool Table, the Ramsey features a 3 piece 1 inch thick diamond honed slate with a solid core liner.